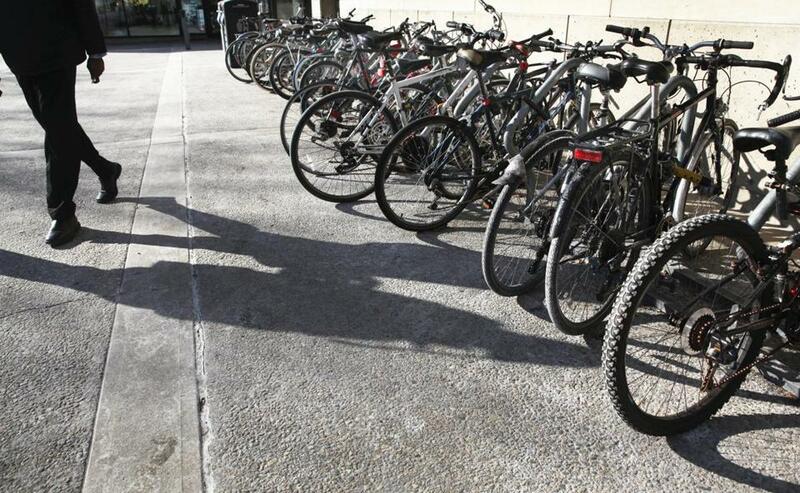 Winter biking’s popularity was suggested by the line of two-wheelers outside MIT’s Stratton Student Center on Friday. The Massachusetts Bay Transportation Authority has taken another step toward buying diesel trains that would run on the Fairmount Line and could eventually provide a direct link from North and South stations to Allston and Cambridge. Earlier this month, the agency began soliciting bids for 30 of the self-propelled rail cars, which can run on the existing commuter tracks and mimic regular subway or trolley service. The 30 cars — called “diesel multiple units,” or DMUs — would cost about $240 million, according to Joe Pesaturo, the MBTA’s spokesman. The trains would first be put to use on the Fairmount Line, where they would provide more frequent service between downtown and neighborhoods along the route to its terminus in Readville, including Dorchester, Roxbury, and Mattapan, according to Pesaturo. Officials hope to eventually expand the use of these trains to create another rail line. The “Indigo Line” would provide a faster link between downtown and Allston, where transportation officials plan to build a commuter rail station by 2020. Richard A. Davey, who served as transportation secretary in the Patrick administration, said the new trains will help accommodate the metropolitan area’s growth while being cost effective. Matthew Danish, an Allston resident, said frequent service could help transform his neighborhood. “I think it would attract demand, and development would follow that demand,” he said. However, Paul Regan, the executive director of the MBTA’s advisory board, said he is wary about funding a new type of technology if the project would compete with funding for a solution to congestion at North and South stations. “It doesn’t change the two big problems for commuter rail, which is space at South and North stations and the ability to finance these new things without compromising the existing system,” he said. The bids for the new trains are being accepted until April, and T officials expect the trains to be delivered by 2020 or 2021. Richard Fries, a longtime marketing director for Best Buddies International, will take over as executive director of the Massachusetts Bicycle Coalition, the organization said this month. John Siemiatkoski, a MassBike board member, said Fries “blew the hiring committee away” with his unbridled enthusiasm for cycling. He said Fries understands bicycling belongs to more than just the serious cyclist. Fries, who lives in Lexington with his family, was traveling and could not be reached for a comment last week. In an interview posted on MassBike’s website, Fries said he hopes to increase the nonprofit organization’s membership of about 3,000. At Best Buddies International, an organization that connects volunteers and people with disabilities, Fries organized multiple cycling events. He is well known in the cycling community as a cofounder of the annual KMC Cyclo-cross Festival in Providence and as an announcer at various rides. The Pittsburgh native will replace David Watson, who said in the fall he would be stepping down as executive director. Fries officially starts at the Boston-based organization on Thursday.